Every single sound rental for companies has different requirements. We often hear the following. Can I hire a microphone? What’s the minimum number of people for a sound system? Can I play music through it? The client has requested a wireless microphone, can you supply one? We want to connect to a laptop, is this possible? I need a sound system in a restaurant, can you do this? At Audiovisual.ie we understand the various requirements of corporate sound rentals. We supply the highest quality audio systems every time. We specialise in line array audio systems which are active, discreet and impose no visual impact on the surrounds in which they are used. We say, a good sound system should be heard and not seen. There is nothing worse than arriving to a function and the sound system in use looks like it was working in a nite-club till the early hours of the previous morning. Corporate sound systems should be neat, clean and unobtrusive. The sound should be crisp and of the highest quality. The system should be suited to the application. Corporate sound rental applications come in every shape and size. For example Town halls or All-hands meetings , Office parties, Product Launches, Book Launches, Trade shows. There are many different requirements placed on sound systems. For example, during the day it will be used for presentations or background music, after lunch it will be used for speeches and possibly connected to a projector to show a video. Perhaps in the evening the DJ will arrive and plug in for a bit or R&R. It is important that you discuss all the various requirements with your AV rental company so that the right system is supplied. A good AV company will deliver, set-up and operate your equipment (if required), thus allowing every stage of your event to run seamlessly into each other creating a great experience for everyone in attendance. Each segment will present different technical challenges in relation to cables and connectors, location and timing, all of which will have to be planned out to ensure everything runs perfectly. Consider a technician onsite to oversee all of this and allow you to get on with enjoying your event. 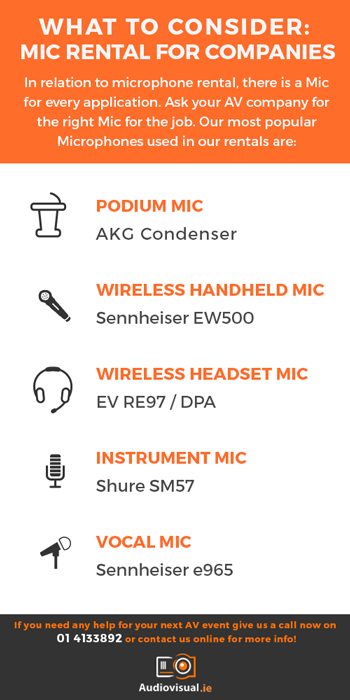 In relation to microphone rental, there is a Mic for every application. Ask your AV company for the right Mic for the job. Our most popular Microphones used in our rentals are. Some microphones are designed to be held up to the mouth and capture sound from a very specific area, some are designed to capture sound from a distance or a general area. For example, if a choir or large vocal ensemble are performing they will require a very different Microphone set-up than a solo vocal performer. Again, any AV company worth their weight will advise you here. Whatever your event entails, talk to us. We have years of invaluable experience supplying sound systems for every type of corporate event of every shape and size. The chances are we’ve done it. Call me on 01 4133892, email me ivan@audiovisual.ie or contact us online to chat more. New Premium Pioneer DJ Decks For Hire! The 4K Portrait LCD Flat Screen: It’s a Masterpiece! Webcasting Services – Be Seen Online!